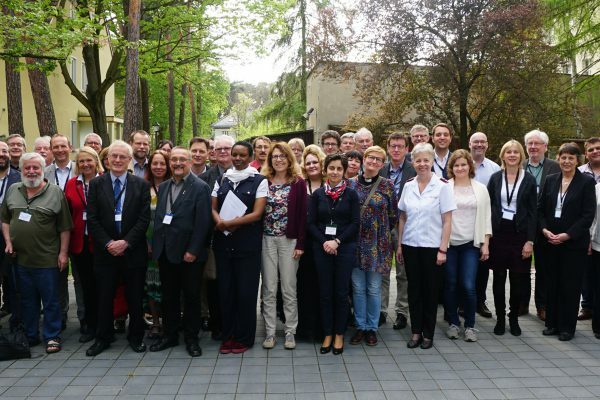 CEC’s Church Action on Labour and Life network (CALL) brought together more than fifty academics, theologians and members of CALL network for a conference on “Digitalisation and the future of work and social relations”. The conference was held from 23 to 25 April in Berlin. Themes in focus at the conference were “digitalisation and the transformation of the manufacturing and service sectors,” “digitalisation and the gig and platform economy” and “digitalisation – social relations – social cohesion”. At the conference Prof. Dr Irmgard Nübler of International Labour Organization analysed mega trends of digitalisation and the future of work. She underlined that after a period of job destruction the labour market might enter into a “golden age of job creation”. She emphasised that the technological change shouldn’t be perceived as a fate, but social movements and governments have to shape and define the goals and the frame of the development. The market will not do that on its own. Mikko Perälä, Social Impact entrepreneur from Finland, highlighted the opportunities offered by new technologies. He explained a project of cooperating with disabled persons in Bangladesh and Pakistan via a platform that guarantees a salary far beyond the average and finances the community building. Prof. Dr Tony Hey, Chief Data Scientist at the UK’s Science and Technology Facilities Council pointed out the tremendous importance of education. He said that education should not only provide the necessary skills but also the cultural ability to use technology. He described the speed of change which is experienced as a disruption with social and political consequences. Dr Martin Beckmann, policy officer on services policy, Trade Union ver.di, expressed concerns about new kind of business and labour models. He said these models exclude people from social security and labour rights who are considered self-employed. Eugenio Leanza of European Investment Bank, pointed out changing relationship between finances, labour market and development of the urban space. He said such a space will have a different infrastructure in a digital and platform economy than in an industrial economy. Prof. Dr Torsten Meireis of Humboldt-University of Berlin, reflected from a protestant theological and socio-ethical perspective about “good work” as a “calling”, which could help to overcome the digital divide. He emphasised that everyone is called by God to serve freely ones’ neighbour. Therefore, in the process of digitalisation, criteria of good work are the recognition of a person, sharing of security and wealth, political participation and the possibility of a good life. Prof. Dr Radu Preda, Chair of the Faculty of Orthodox Social Theology of the University of Cluj-Napoca, made a written contribution, in which he outlined the task of Christians to speak out against the abuse of workers. He reported about the gap in the labour market in Europe, where in some countries many young people are leaving to other EU countries to find job opportunities. The conference concluded with a panel discussion by Bishop Dr Markus Dröge of Evangelical Church Berlin-Brandenburg-Schlesische Oberlausitz, and Protopresbyter Dr Georgios Basioudis, Greek Orthodox Metropoly from Germany. Bishop Dröge criticised the lack of public debate about the consequences of digitalisation and the growing capabilities of algorithm. Fr. Basioudis highlighted the remaining mission of the church for pastoral care, relation and community building. A communique titled Digitalisation and the future of work and social relations was issued at the end of the conference. The document includes key reflections, questions, challenges and tasks for the churches to carry out on local, national and regional level.